107.7 The Bronc plays the biggest hits and best variety. Our student DJs have the freedom to choose their own music and program their own shows. No playlists, no charts – it’s true free form radio. Our DJs play everything from hip-hop to country; Top 40 to dub step! Our music library consists of thousands of titles, both on CD and hard drive. When our student DJs aren’t spinning tunes, our student program director plays everything from the ’70s to right now twenty-four hours a day, seven days a week. For all those sports junkies out there, we broadcast so much Rider and non-Rider sports so you can keep up with your favorite teams. With Rider sports, you can hear coverage of our men’s basketball, women’s basketball, baseball, and ice hockey teams. Non-Rider sports include Hopewell Valley Bulldogs and the Lawrenceville Cardinals football. More information can be found under our Sports tab. During the weekdays, 107.7 The Bronc garnishes your lunch with the #GetForky Bronc Lunch Box. 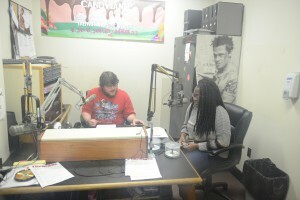 From Noon to 1 p.m., 107.7 The Bronc features a different meal of music every weekday. These include Acoustic Appetizer on Monday, Live Slices on Tuesday, Woodfired Covers on Wednesday, Thirsty Throwback on Thursday, and Local Music Nuggets on Friday. After the end of a long week there’s only one place to kick off your weekend…Killarney’s! Join 107.7 The Bronc every Friday night at 10 p.m. for The VIP After Party, live from Killarney’s Publick House, 1644 Whitehorse-Hamilton Road, Hamilton. On the weekends, the oldies come out to play with our Solid Gold Weekends – the best Motown, Soul, and good time Rock & Roll from the ’50s and ’60s and pre-Beatles rock ‘n’ roll.